He always meant to start a war. 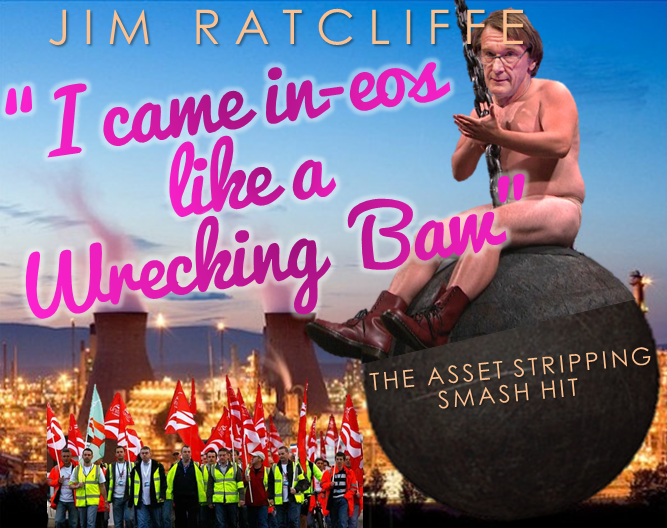 In fact when Jim Ratcliffe swung into Scotland on his wreckin’ baw last month, holding thousands of jobs and a crucial part of Scotland’s energy infrastructure to ransom as he dangled overhead, he had few other intentions. Ratcliffe got the war he wanted – and a crushing victory from which the tremors are still being felt. 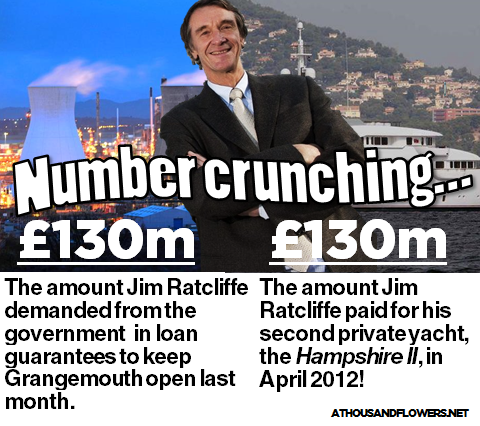 In case you were wondering, Jim Ratcliffe is the shadowy Bond villian-esque billionaire – with his two superyachts, beachfront mansion complex and petrochemical empire – behind Ineos, the multinational firm which bought out the Grangemouth refinery from BP in 2006. Having built Ineos up from nothing on the basis of asset stripping other businesses and ruthlessly cutting costs, the company were on a collision course with Grangemouth’s well organised workforce from the day they took over. Having been forced into a humiliating climbdown on pension changes after a two day strike in 2008, Ratcliffe was out for revenge. When an opportunity arose earlier this year to stick a dagger into Unite after their convenor at the plant, Stevie Deans, became embroiled in the Falkirk Labour candidate selection fiasco, it was seized upon. As the dispute escalated, it became clear it was less about whether one guy sent some emails from his work computer, and more about their shareholders (otherwise known as Jim Ratcliffe) wanting to continue their relentless drive to push up profits at the expense of everyone else. When enough workers didn’t volunteer themselves for wage cuts and worse terms, Ineos announced the whole plant was unprofitable and would have to close. Panic mode set in, the union capitulated, the government threw money at Ratcliffe and the jobs were saved. The aftermath saw Ratcliffe widely rounded on for being a profit-hungry scumbag who was willing to throw thousands of people, and one of the few remaining major industrial sites in Scotland, on the scrapheap just because he couldn’t get his own way. Creative accounting may have shown Grangemouth to be in the red – apparently selling oil is just sooo tough these days – but it was objectively clear that the business still continued to rake in huge profits. Ratcliffe was unrepentant, toasting his triumph by telling the media that Ineos “are Brits and have done our bit for the UK”. We’ll have to wait and see whether his great patriotic act of October 2012 yields him an OBE for services to union-busting or a Pride of Britain award for not sacking people, but it’s certainly an interesting way of putting it when his company hasn’t paid any UK tax in years, having relocated to Switzerland for avoidance purposes in 2010. Just doing their bit for #teamGB! But Ineos were on the attack, so the story couldn’t end there and started to take on a new momentum. As they say, history’s written by the victor, and a cursory glance at the news over the past few weeks shows the headlines filled with horror stories of ‘bully-boy’ rogue trade unionists, giant inflatable rats blocking driveways and ‘specialist intimidation units’ terrorising leafy suburbs across Scotland. Eager for an opportunity to attack Unite and catch Labour in the crossfire, the government waded in with David Cameron stating that “No-one has a right to intimidate. Nobody has a right to bully. Nobody has a right to threatened people’s families. No-one has a right to threaten people in their homes. If these things have happened, it is very serious. It needs to be properly examined.” Of course, Cameron wasn’t talking about Ratcliffe, the man who’d just blackmailed hundreds of workers into signing away their employment rights on threat of losing their livelihood, complete with a no-strike clause and agreements to pension cuts and wage freezes… no, he was talking about Scabby the Rat. They were trying to humiliate me. Trying to portray me as a nasty boss, a nasty capitalist. To portray me as someone evil. Their intent was to have my neighbours thinking, gosh, what sort of a guy do we have living there. Yes dear, that’s kind of the point. It’s a clever tactic that’s designed to evade the Thatcherite laws against flying pickets and can be useful in exerting pressure on different stakeholders in a dispute. It also works: Unite have won a number of significant victories in part due to this tactic. The shocking truth of Unite’s leverage programme – so secret there’s a whole page on their website dedicated to it – was, naturally, broken by the Daily Mail in typically overblown style. The inflatable rat soon became a Tory metaphor for how militant 1970s style unions are running the country into the ground (or something). Quick, someone call a COBRA meeting, Unite have a giant rat! 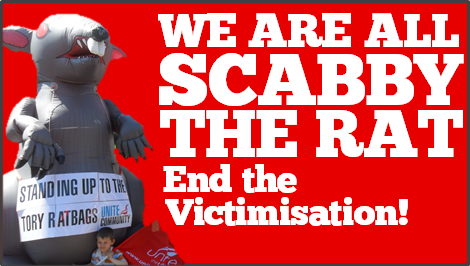 As the Government launches an official inquiry into Unite’s ‘militant tactics’, Scabby has become the unfortunate poster-rat of their anti-union crusade. Even Murdo Fraser is making jokes about him on twitter, a fate I wouldn’t wish on anyone. What happened at Grangemouth is a pretty sorry tale for everyone involved, with one obvious exception. Ratcliffe rolled in on his wreckin baw and held a nation to ransom. Yet that one man who neither lives here, works here or even pays tax here is able to control such a pivotal part of the Scottish economy is not even the lasting scandal. There are to be no government inquiries into the nature of ownership of our energy industry; far from it, hundreds of millions have been handed over from the public purse to them. 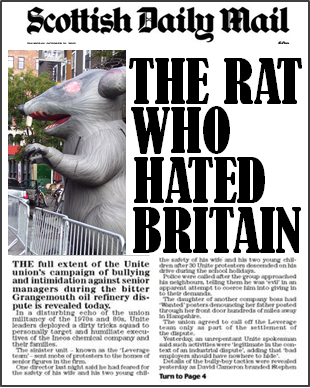 Nope, the lasting scandal is that a few union members were caught on a residential street with an inflatable rat. Stand strong Scabby, justice will prevail! We’ll keep our rat inflated here.